Last winter I spent a few days with a friend on vacation. She ate this almost every morning for breakfast. I like her. She’s in great shape. I want to be just like her. So this is what I eat for breakfast many mornings. And I sprinkle cinnamon on top – I like the taste and cinnamon has some amazing health benefits. What healthy, easy foods do you enjoy? I'm really into smoothies rigjt now. We had to buy a blender recntly, and I've been throwing absolutely everything in there. It makes for easy meals around new baby needs. 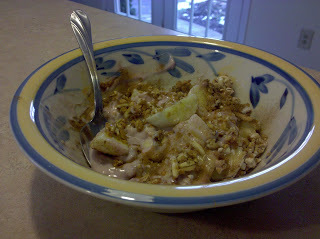 My favorite recipe is strawberries, banana, a couple tablespoons of wheat germ, orange juice, raw milk, and flaxseed oil. If I'm feeling paricularly responsible, I add fresh spinach and some plain yogurt to the mix too. Sooo good! My breakfast consists of a "Green Monster" smoothie in the summer (spinach, banana, oats, almond milk) & overnight oats made with yogurt & oatmeal & topped with fruit in the winter. And I throw ground flax seed in everything. And nuts. Because anything good is better with nuts! I LOVE breakfast! Thanks for the ideas … I will try them sometime. Thanks for the advice on Anne's blog! I appreciate you taking the time to minister to me. I will read your story on your blog. I'm sure I will find more inspiring things as I read on!! Is cake a healthy breakfast food? Janet, thanks so much for sharing your story of healing. Amazing stuff. The comments have just been incredible. I hope you have an amazing year in life and blogging in 2010! It is wonderful to start your day with nourishing food. My favorite is quick oatmeal, I buy quick Quaker oats and use 1/2 cup oatmeal and 1 cup milk. Cook 1 1/2 minutes in the microwave, stir and cook 1/2 minute more. No pot to clean, hurray! Then add what you like: brown sugar, craisins, raisins, pecans, dried apricots, dollop of light whipped cream. Not all of these, just one or two favorites.